Preheat the barbecue or griddle pan to medium. Cut the courgettes side-ways so you have quite thick disks, about as think as your thumb. Thread the vegetable onto the skewers. 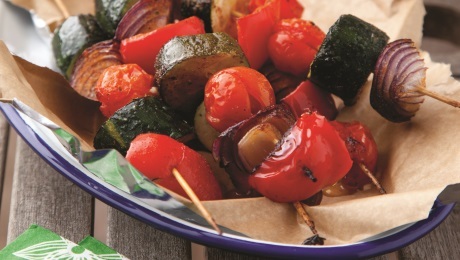 Brush the vegetables with olive oil and cook them on the grill, or roast them in the oven for 3 minutes on each side or until the vegetables are chargrilled. Put a squeeze of lemon on top before serving.